Your GroupWise administrator has set up Novell Data Synchronizer to synchronize GroupWise data with mobile devices. This Quick Start helps you understand what to expect when GroupWise data is synchronized with your mobile device. The Data Synchronizer Mobility Connector supports many popular mobile device operating systems, including Android, Apple, Palm, Symbian, and Windows Mobile. For device-specific information, see the Data Synchronizer Mobility Connector Devices Wiki. If you have questions about configuring your mobile device, contact your GroupWise administrator. As soon as your mobile device connects with the Data Synchronizer system, initial synchronization begins. By default, all of your personal address books in GroupWise, except your Frequent Contacts address book, are synchronized to your mobile device to provide phone numbers for convenient calling. NOTE:Even though the GroupWise Address Book is not synchronized to your mobile device, you can still access individual contacts in the GroupWise Address Book, if your mobile device can do a Global Address List (GAL) lookup. As an alternative, you can create a personal address book that is a subset of the GroupWise Address Book to synchronize to your mobile device. By default, two weeks of past calendar items and all future calendar items are automatically synchronized to your mobile device. On some mobile devices, you can change your calendar settings to request additional past calendar items. By default, three days of past e-mail messages are synchronized from your GroupWise Mailbox folder to the In Box folder on your mobile device. If you want to synchronize more existing e-mail messages to your mobile device, change the e-mail settings on your mobile device. GroupWise items in Cabinet folders synchronize later, when you open each folder on your mobile device. By default, folders in the GroupWise Cabinet folder, as well as other standard GroupWise folders such as Sent Items, Work in Progress, Junk Mail, and Trash, synchronize to your mobile device. However, the contents of these folders do not synchronize until you open each folder. NOTE:The following folders are not synchronized: Tasklist, Documents, POP or IMAP accounts, NNTP Newsgroup accounts, RSS feeds, query folders, and Internet calendar subscription folders. Attachments synchronize to your mobile device along with items, if they do not exceed the attachment size limit. If an item has an attachment that does not synchronize, a message notifies you. After initial synchronization, you can retrieve additional past items by reconfiguring your mobile device. Refer to Help on your mobile device to learn how to change these synchronization settings. 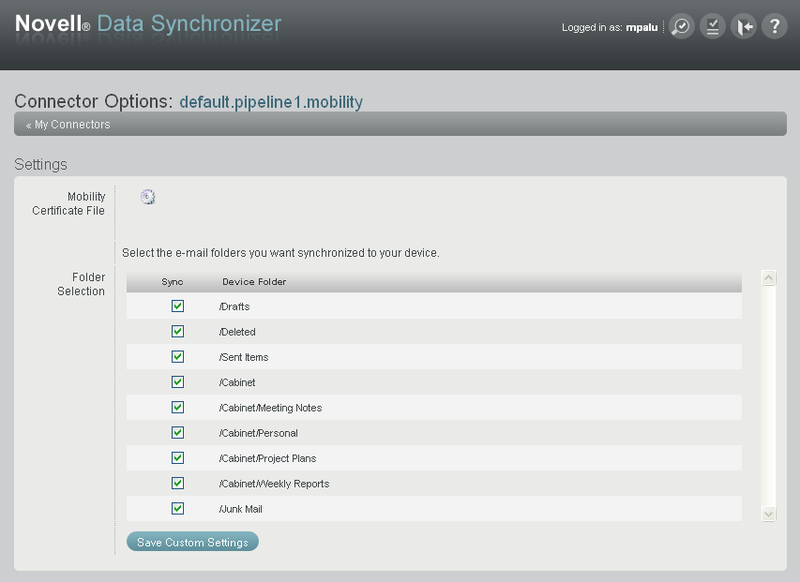 In addition, you can customize some settings in your Data Synchronizer user account. You are prompted to log in. 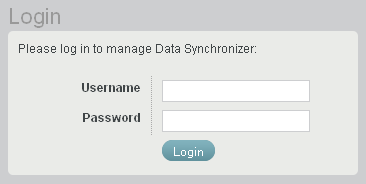 Log in to your Data Synchronizer user account. In the Username field, specify the user name that you use to log in to your network. This might or might not be the same as your GroupWise user ID. In the Password field, specify the password that you use to log in to your network. This might or might not be the same as your GroupWise mailbox password. Click Login to display the Data Synchronizer User Options page. Click on the GroupWise Connector line. By default, all GroupWise personal address books are synchronized to your mobile device, except the Frequent Contacts address book. (Conditional) If you do not want to synchronize a personal address book to your mobile device, Ctrl+click it to remove it from the list of address books that are selected for synchronization. NOTE:Although it is possible on the GroupWise Connector Options page to limit the item types that are synchronized between GroupWise and your mobile device, changing the default settings is not recommended. Click Save Custom Settings, then click My Connectors to return to the Data Synchronizer User Options page. Click on the Mobility Connector line. By default, all GroupWise folders are synchronized to your mobile device, although the contents of the folders are not synchronized until you open each folder on your mobile device. (Optional) Deselect any folders that you do not want to synchronize to your mobile device. Click to log out of your Data Synchronizer user account. After initial synchronization is complete and your mobile device contains all desired data from your GroupWise mailbox, synchronization of items and actions continues, regardless of whether you are working in your GroupWise mailbox or on your mobile device. You might notice that a few items do not synchronize as you might expect. For a list, see Item Synchronization Issues in the Mobility Connector Readme. For device-specific information about ongoing synchronization capabilities, see the Data Synchronizer Mobility Connector Devices Wiki. Copyright © 2010-2011 Novell, Inc. All rights reserved. No part of this publication may be reproduced, photocopied, stored on a retrieval system, or transmitted without the express written consent of the publisher. For Novell trademarks, see the Novell Trademark and Service Mark list. All third-party trademarks are the property of their respective owners.